Security threats, from cyber criminals or shadow actors, are constantly evolving and becoming more prevalent and dangerous than ever. In response, Microsoft reinvented Windows 10 Enterprise from the ground up to make identities stronger and data safer, no matter where it lives. With universal connectivity now the norm, users’ identity is now the new perimeter security defence. 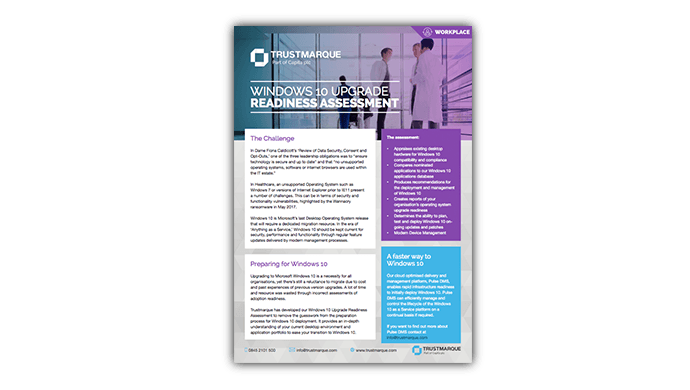 As the most secure version of Windows ever, Windows 10 Enterprise protects organisations from today’s threats. Windows 10 brings a whole new set of protection capabilities for identity, information protection and malware resistance. From encryption and firewall features to antivirus and anti-phishing technologies, you get revolutionary security advances, designed to satisfy the demands of the largest global organisations and enterprises. Windows 10 is Microsoft’s last operating system and the last time that a full-scale version change is required. Instead, there will be a regular stream of feature and functionality updates, as well as continual security patches and updates. As one of Microsoft’s leading partners within the UK Healthcare sector, we recently hosted a Windows 10 webinar specifically for NHS organisations. Whether you’re a single hospital or a whole CCG, you can still hear Trustmarque’s Windows 10 Solutions Architect Steve Perry speaking alongside Chris Lim from PowerOn Platforms​, discussing why you should consider Windows 10 and how you can prepare, accelerate and manage adoption quickly and efficiently​. We are offering a limited number of free half-day discovery session for you to find out what your organisation needs to consider and do before you can move it to Windows 10. You will be shown what features Windows 10 has and how they will enhance your organisation’s IT capabilities and cyber security posture. We will also discuss what obstacles you may need to overcome to be successful. This is an ideal opportunity to pick our experts’ brains and get the answers to any questions you may have however big or small. The half day discovery session can be a face to face meeting or a remote interactive seminar, whichever suits you best. Following this approach better equips us to help you to meet the demands of a varied workforce while also enhancing security and productivity for users that will ultimately benefit patients.